I've had yet another great dinner at Pistachio Dining, found tucked away at the Torrens shops. The ‘Leave it up to Dave’ dining option is the only one we select now. Not that their menu (read, their new Winter menu) isn’t full of tasty options, but not knowing what each dish will be is quite exciting! 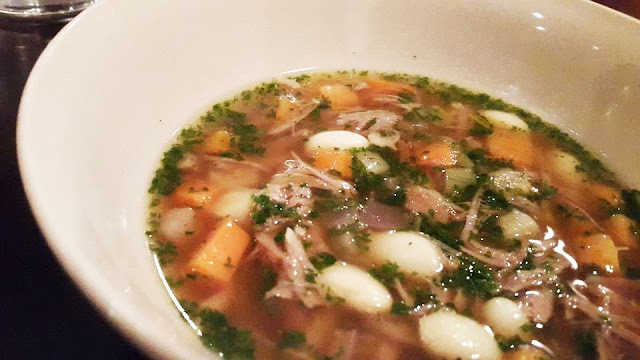 Red wine braised lamb shank soup with vegetables and white beans. A delicious winter warmer starter. 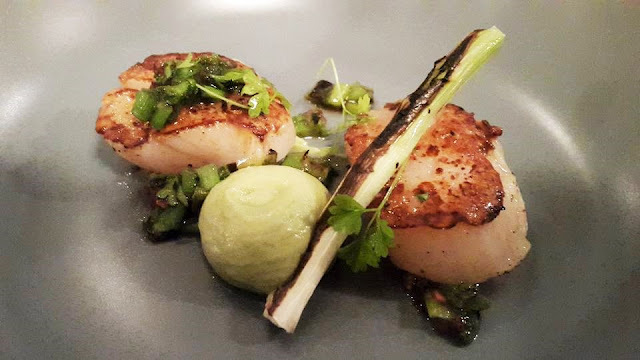 Scallops with seared spring onions and pureed avocado. 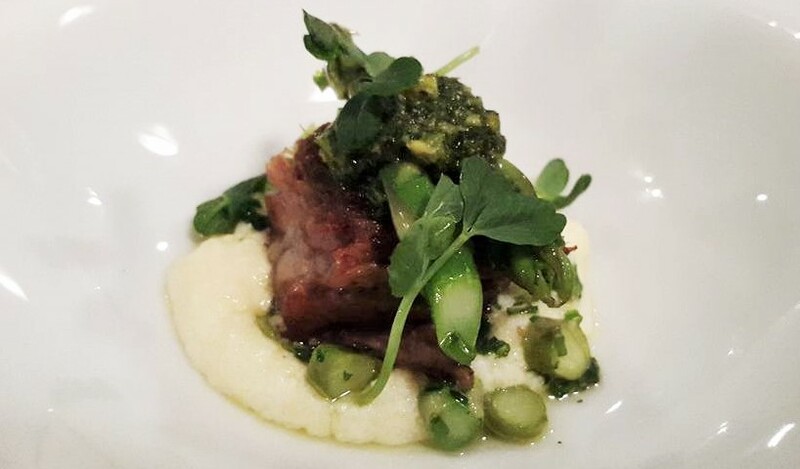 Slow cooked lamb shoulder, soft polenta, asparagus and herb sauce. Confit pork belly, Toulouse sausage, cabbage and seeded mustard mix, potato crisps, beetroot jus and parsnip puree. The beetroot jus was made by slow roasting red and white onion, and beetroot. Then further reducing. It must have taken Dave hours, but the result was amazing. 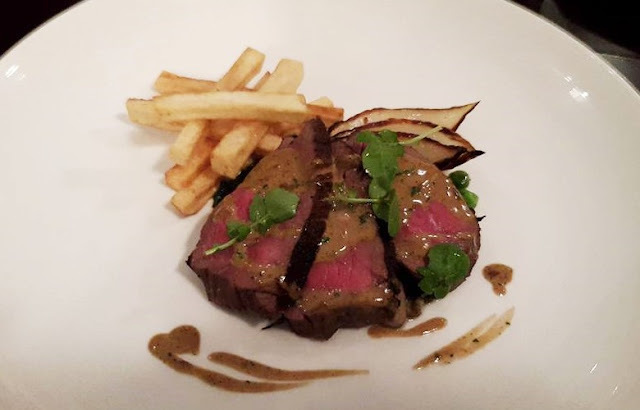 Pepper steak, with grilled onion and hand cut salty crunchy chips. Vanilla brulee and almond & pistachio biscotti. Chocolate and hazelnut blondie with dark chocolate mousse, Kahlua sauce and raspberries. Lemon and lime curd tart, mascarpone, and ginger beer sorbet. Dave spoiled us, by slipping in another course. Technically his ‘just feed me’ option is meant to be four courses, plus a starter. Dinner and couple of drinks was incredible value, as I used my Entertainment Book discount for a 25% saving. Total cost; only $54 each. With only one transaction, the savings are half what the Entertainment Card cost. It will pay for itself in no time! Most of the dishes looks and sounds delicious! The dessert platter has got me craving for those.. So much effort and creativity went into the desserts, they were amazing. Oh man, all of that looks so delicious. I really want to try the pork belly. (I have a thing for pork belly) But the scallops look equally delicious! We mentioned to the waitress how good the pork belly was and she insisted the chef Dave put some aside for her. It was really very good. So flavoursome and almost melted in your mouth. As much as the pork belly and the seared scallops look great, that steak really made me drool! This looks like a fantastic restaurant! It really is a gem of a restaurant and is tucked away in a suburb. I heard the following night (Saturday) it was booked solid. OMG, I shouldn't have read this before dinner! Everything looks amazing -- that soup, that pork belly, those scallops! I was only in Australia once years ago - before food blogging was really a thing and no Instagram even -- I need to come back now! Especially for the food and wine regions as there is so much going on! Indeed, Australia has soooo much great food to offer. So many regions, so much food, so little time (and belly space)! Aaron, the steak was awesome. Just the right thickness per slice, cut like butter, and the pepper sauce gave it just that little something something. Too much more and it would have been too much. Perfect sized serve. Wow, what a wonderful spread! The scallops look beautiful while for me the pork belly is takes the cake! These pics make me very hungry!! Yum! Glad to have whet your appetite!!! We weren't stuffed afterwards , which was good. But it did take us 2.5 hours to get through it all, but we didn't really notice the time. Love the anticipation before each dish came out, as we didn't know what was coming. All of this looks amazing. Scallops are one of my favorite things in the world. But then again so is lamb lol. I would try every one of these dishes. I love a two and a half hour dinner. The lamb shoulder would have also made a tasty slider, for a casual lunch, the meat just pulled apart. 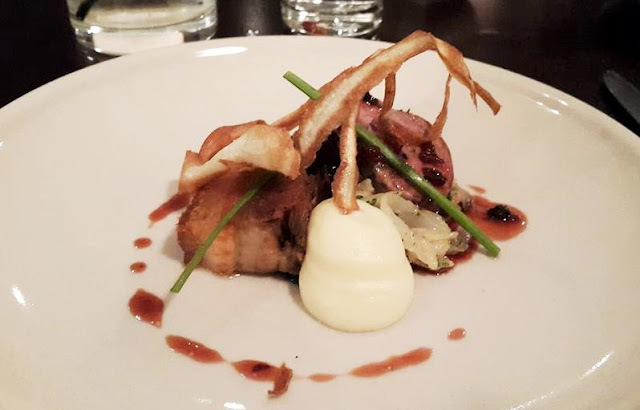 Yes, taking time to savour a dinner is a wonderful indulgence. Get outta town, that is an amazing price for all that yumminess! 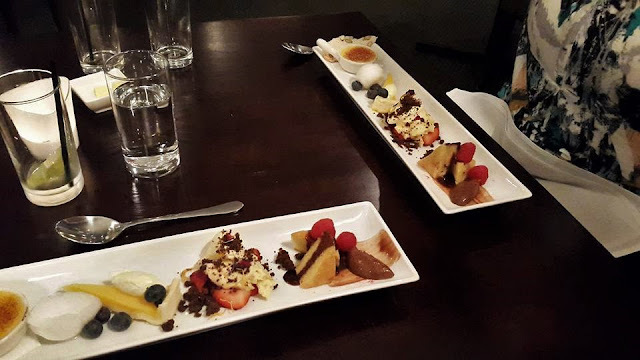 :) Especially the dessert tasting plate... WOWZA! Love that you had a long and lazy dining experience too, I think that is probably a great way for your system to 'take it all in'. Great photos too, looks like a restaurant that is set for the food blogger. The more often we go, the more spoilt we get. Dave and his team are so used to us pulling out our phones to snap away at the creations. I taught my friend about Twitter at our first outing at Pistachio, and now she converses with Dave... and he responds from the kitchen!! Then he came out and we had a long chat. He's one cool cat.